Move in Condition Updated Villa in Lakeshore Village. This 2 bedroom, 2 bath end unit with 2 car garage has an open, bright floor plan w/cathedral ceilings & skylights. Beautiful lakefront unit has a peaceful water view. Remodeled kitchen with new cabinets, Corian countertops & newer appliances. Bathrooms updated. Master bedroom has lakeview and two walk-in closets. Inside utility room. Glass enclosed lanai with Hurricane rated windows and beautiful lakeview. Tile roof replaced 2006. Unit replumbed 2009. New A/C unit 2011 and new duct work 2017. Hurricane rated garage door. Lakeshore Village is a 55 plus community, 10 minutes to Siesta Key #1 rated beach. Convenient to restaurants, stores & I-75. Active vibrant social events. Amenities include heated pool, tennis courts, horseshoe courts & Billiards room. Clubhouse with kitchen, library & restrooms. 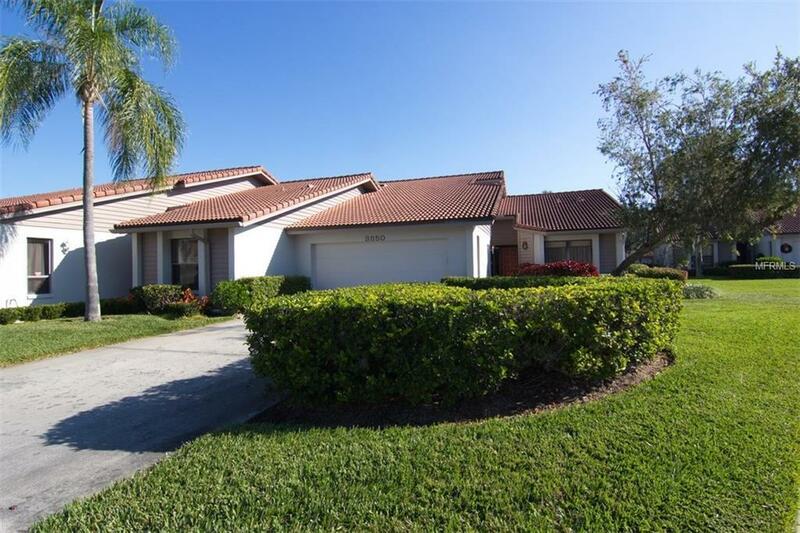 Beautiful community with winding roads and mature well maintained landscaping.